Total Workshop search results: 42. Displaying Page 1 of your woodworking search phrase FREE CAT FURNITURE PLANS. This table could work in a number of locations and has a lower shelf for added storage. Finished measurements are 19.25 inches deep and 33.5 inches long. This cabinet looks more complicated to build than it is. It features two bi-fold type decorative doors on the front with two shelves inside. Here are the free plans. When you see this table for the first time, it is hard to know where to focus your attention. Between the figured veneer of the top, the graceful curves of the legs, and the six-sided column, there are plenty of things to catch your eye. The cutting diagrams and materials list are available to download in this Online Extra. Turn your extraordinary piece of wood into an uncomplicated table for the hallway or behind the sofa. Excellent for serving light refreshments and useful on any occasion where a light utility table is needed, this folding unit makes a compact bundle readily stored out way when not in use. If you started building the traditional series of furniture designed by Whitcomb, this is the occasional table for that set. Sometimes a quick and easy project can be just as enjoyable to build as one that is large and complicated. Maybe its because you can make something that looks good without a huge investment in time or materials. That is the case with these picture frames. The cutting diagrams and materials list are available to download in this Online Extra. Get the look of a card catalog cabinet without all of the work. This one features one large door with shelves inside. Here is how to build it. Easily build this cabinet which has two shelves inside. The pattern on the doors is easily duplicated with rivets or paint and a scroll stencil, or leave them plain. Follow along and build your own card catalogue cabinet. It could even be an end table or night stand. Link Type: free plans | Link Source: NotJustAHousewife | Visit the category | Fix Link? Here is a perfect table for use in a front hall, behind a living-room sofa or in your bedroom for showcasing your favorite knickknacks. Besides being narrow enough to fit in a variety of locations, its two drawers provide convenient storage for small items. 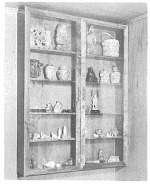 The plan says: This elegant curio cabinet was built of solid walnut with 1/4 inch walnut plywood backing. The model is sized as shown below but you may build it according to the size you need by following the directions given. Magnetic catches and lock and highly styled handles complete the cabinet which will enhance your prized collections and keep them dust free and safe. It is always nice when you find a great-looking project that can be built in a weekend or two. One that will not drag on. Or have complicated assembly. Or require lots of expensive hardware. That is why I like this shelf. It is straightforward to build, and you get to spend some productive time in the shop and end up with a handsome project in a short time. The cutting diagrams and materials list are available to download in this Online Extra. If you lack a dedicated spot for paying bills and stashing loose stuff, a good desk is a must. See how to make it yourself. This bright little desk offers the perfect perch for the budding toddler scholar. School bus-yellow paint is an eye-catching accent.